Back in April I was asked to talk to our parents about our changes in mathematics. We have moved to an integrated math curriculum and a 1:1 laptop programme and our admin felt that it would be nice if our parents had an idea about what that might look like. I decided to walk the parents through a typical activity from a 9th grade maths class. With limited time to present I made a 4 minute video and uploaded it to Youtube. To save you from watching the whole thing I can give you a little rundown. The Penny Circles activity comes from Desmos.com and Dan Meyer which instantly makes it wonderful. I show the parents what the student experience would look like and the math that is involved. I mention a little about the AERO standards and the learning advantages of an activity like this and then I send out the link and encourage the parents to try it at home. At the beginning of Semester Two I will step into my new role at Graded School as the Middle School Teaching and Learning Coach. This is a gig that I hoped to start back in August but we weren’t able to secure a HS Maths teacher in time so the transition has been stretched out a bit. In the end it’s been a blessing as I’ve had time to really plan out and prepare for my new responsibilities. I think that reworking this video into a digital story for maths teachers could be a neat resource. As it is, the video is a recap or a preview of an activity that my students could do in class. If I was to build it out I would create a story about “Technology in the Classroom” or “Maths and SAMR model” and work through the stages of implementation using stills and video from my classroom. The Educause Learning Initiative describes Digital Storytelling as “the practice of combining narrative with digital content, including images, sound and video, to create a short movie, typically with a strong emotional component”. I can’t say that a video about maths and the SAMR model will be oozing with emotion for the vast majority of folks out there but I will try! 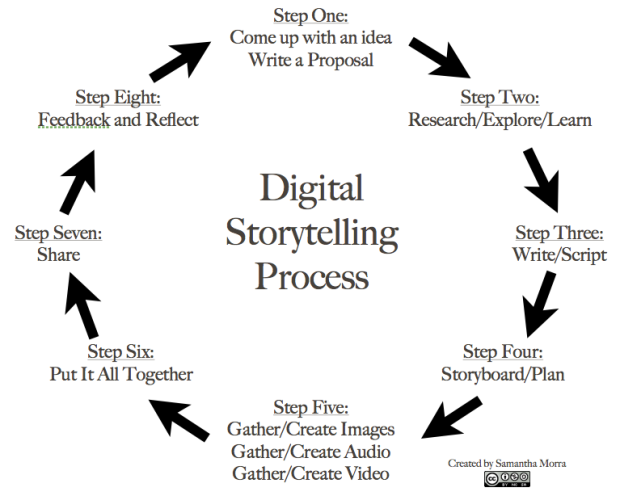 Samantha Morra gives us 8 Steps to Digital Storytelling and I will use this to get started. The chart below is a neat summary of the process. I’ll complete steps five through eight for my final project! An Infomercial or a Digital Story? But a lingering question: Is a short video made by a teaching coach for the purpose of informing teachers about Maths and SAMR a digital story? Almost everything I read talks about digital story telling as a digital version of traditional story telling. Fiction or non-fiction they all seem to have a story-like element and show examples of how our students use digital storytelling to demonstrate their learning. Am I missing the point here? My audience is different and my purpose is more informative than entertaining, but does it work? I’m preparing a presentation and they say that sharing stories is a powerful and effective way of informing. It engages our emotions, for one thing, and makes the content more memorable. I’m reading a digital book called “Resonate” https://www.duarte.com/book/resonate-multi-touch-book/ that actually teaches us to give information presentations in a form of a story with many parallel elements to those of a story.